Seamless Gutters Waunakee, Gutter | I.G.S. The best brand of seamless gutters to buy for your home in Waunakee, Wisconsin, is Absolute Gutter. Developed by Innovative Gutter Solutions, LLC and strictly available from pre-approved installers, Absolute Gutter is always custom-bent onsite and doesn’t exhibit any unsightly seams. That’s right – these gutters are fully seamless. Even the end caps, which would normally be installed separately, are wrapped around from the back of the gutter system to produce sleek transitions and clean corners. The seamless design of Absolute Gutter greatly reduces the amount of caulking that is required. Less caulking means a lower risk of future leaks and fewer gutter repairs. Thanks to an ingenious design, Absolute Gutter doesn’t let water pool up and submerge the edge of the roof in the event of a clog. Instead, it escapes over the front lip which is purposefully designed to be one inch lower than the back of the system. 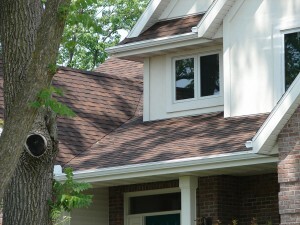 For more information, contact Innovative Gutter Solutions. Our team will be pleased to put you in touch with an authorized installer of our seamless gutters serving Waunakee, WI.